Although there are many investment chart templates available on the internet, not all of them are as flexible as these ones above. Simply choose the best one, click the picture to download, then it's yours. If you don't like the color or design, never mind. All the templates are customizable, allowing you to change text, colors and styles. 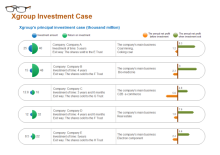 View the featured presentations, charts, infographics and diagrams in the Investment category. Free download investment templates on professional diagram sharing community. With Edraw, you can edit and print the free investment diagram templates for personal and commercial use.